This Sunday’s passage is the story of a miraculous event that even many non-church-goers are familiar with. It’s the story of the wedding feast in Cana where Jesus turned water into wine and not just any wine, but great wine. Now, as appealing as that might be, what are we supposed to do with this story and the other miracle stories we find in the New Testament? For some, the answer is clear: “If the Bible says it happened, it happened just the way that it’s written – end of discussion.” Others try to find rational explanations for what only seem to be miraculous events. According to Dr. Mike Graves, both extremes are missing the point of these stories. Our mission, should we choose to accept it, is not to blindly accept these miracles as fact or to wrestle with rationalizations of them. Our mission is to figure out what the gospel writers wanted us to learn through these stories. Perhaps this is why the writer of John’s gospel chose the word “signs” to describe the miraculous acts of Jesus. Like signs we encounter on a daily basis, could these miraculous acts of Jesus – these signs – point to fuller and richer revelation of Jesus’ character and mission? In this story, the miraculous transformation of water into wine is commonly understood to be a sign that points to his divinity. Yet, the exchange with his mother points to Jesus’ humanity. Like some of the exchanges I had with my mother growing up, Mary pretended not to hear Jesus’ objections to helping out and Jesus ultimately went along with her plan. Karoline Lewis wonders if this part of the story provides a reminder that, whenever Jesus reveals his divinity, he is also revealing something of his humanity. If this is the case, maybe this story of water being transformed into wine has something that we need to know about ourselves and what it means to be Jesus’ disciple in the world today. I hope to see you Sunday as we look deeper into this story. Here is a LINK to last week’s sermon. Our Church Administrator, Debbi Adams, is out of the office for approximately six weeks while she recovers from surgery. During this time, Gerald Hiller will be covering Debbi's financial duties. If you have a question about financial concerns, please direct it to Gerald, hillerge@aol.com. If you have any other office questions, please contact Patty@sacchome.org. We ask God's blessing and comfort for those struggling with health issues and life's other difficulties. Please keep in your prayers Karen Schwark, Linda Peyton, Janey Pryor, Jamie Frazier and Debbi Adams who are all recovering from surgery..
We wish to express our deep appreciation for the congregation’s donations to our Christmas gift. You are exceedingly generous and supportive! It is an honor to serve in ministry with you. If you live on the south side of the metro and would be willing to drive someone to church once a month, let us know! We’re currently in need of 2-3 drivers. We have a hard-working coffee team that makes sure we have coffee every Sunday morning. There’s a need for someone to pitch in on 5th Sundays -- so only 4 times a year. Training and much appreciation provided! Mercy and Truth is a KCK Medical non-profit providing medical ministry to the under served both locally and internationally. This was the first mission to Colombia for this organization. Hatsie and Norm joined this team to be of service but also learn how Mercy and Truth runs overseas mission clinics. The team saw over 600 patients and distributed over 500 pairs of reading glasses to poor residents of south Bogota including many Venezuelan refugees. Hatsie was on the last mission trip to El Higueral where she also ran a clinic for the residents. Part of her motivation was to learn Mercy and Truth to possibly provide an improved clinic in El Higueral. Norm's motivation, in addition to service, was to get a sense of the direction of the country since the peace agreement with the FARC guerrillas has been reached and they are now part of the government. They will discuss the role of small Evangelica churches in these neighborhoods and healthcare needs of the population. There will be time for questions and class discussion. Look around you. Did you ever think someone you know might need blood? It could be that person sitting next to you, or it might even be you or a family member who might need it someday. Give of yourself by signing up to donate. If you are unsure of when you might be available, just drop in on Monday from 3:30 to 6:30 pm. We will be glad to see you! you can also sign up in the Hearth Room on Sunday or on the CBC website today! Sunday, January 27- NEW DATE & Time! All ages are invited to attend! We will discuss the book The Wednesday Wars by Gary D. Schmidt. Meet in the Youth Room at Noon, Sunday, January 27. Please bring a snack to share. Questions? Contact Crysta Baier. Vacation Bible School – SAVE THESE DATES! VBS will be June 10-14, 2019. We’re super excited about our theme – To Mars and Beyond! Watch for more information coming soon! We will begin meeting on the 4th Thursday of every month. Hope see you on January 24, 7:00pm at Spin Pizza in Olathe! Save the Date!! Our annual women’s retreat will be May 3-4, 2019 at Tall Oaks Conference Center. We are thrilled to announce that our keynote speaker is Rev. Kerry Waller Dueholm. Kerry is ordained in the Disciples of Christ and is a Licensed Professional Counselor – and she grew up at Saint Andrew! We’re still working together on the retreat theme. If you’d like to be part of that conversation, please contact Lois Penn, loispenn@yahoo.com. SAGE gratefully accepts your donations of bird seed or cash to purchase bird seed. Cash donations can be placed in the birdhouse located in the Hearth Room or in the offering basket marked "bird seed." Bags of bird seed can be placed in the marked space in Friends Hall. 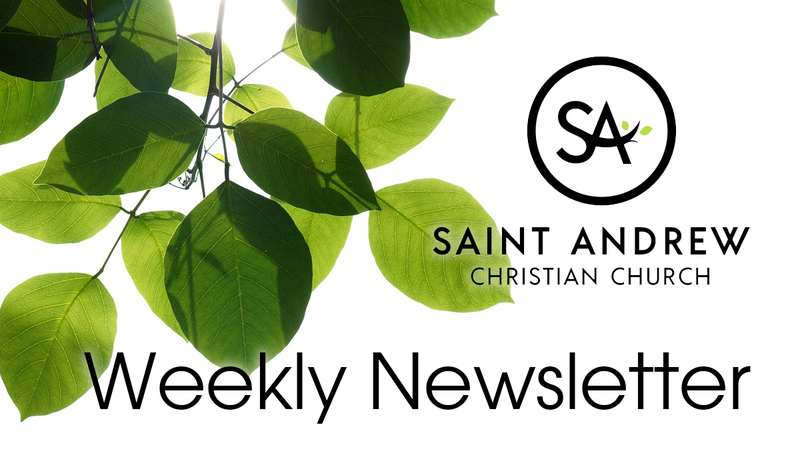 The Saint Andrew Mission Team resolves to seek God, create community and practice justice by actively promoting congregational engagement in the community, both locally and globally. Next training for IHN (Interfaith Hospitality Network) will be January 24, 6:30-8:30. The address is 7416 Roe Avenue, Prairie Village, KS. No RSVP required. Please consider becoming educated about this Saint Andrew mission. Our next host week will be March 31-April 7. We are now using a Google Drive site to provide Saint Andrew members with monthly financial reports, Leadership Circle minutes, current directory, and access to other important SACC documents. If you would like access to these documents, please email Debbi@sacchome.org.